There is a striking similarity between Jesus and the Old Testament prophet. Like the seers, he considered himself to be the watchdog over the good things in Israel's heritage. When the chosen people mishandled the treasurs given them by God, Jesus, like the prophet before him, leveled blistering accusations against his own house. Strangely enough, most of Jesus' skirmishes were with the religious leaders of the day. Convinced he could not penetrate the hard shell of their spiritual indifference with kindness and compassion, Jesus lashed out at them and addressed them as hypocrites, blind guides, fools, whitewashed tombs, and serpents. He decried the destruction of God's original purposes of the law. He bemoaned the darkness of those hearts which made the law more important than life itself. He flayed the myriad of rabbinical stipulations which had turned legality into a farce. He abhorred the hypocritical attitudes of those who honored the letter of the law but viciously distorted the spirit in which it had been given. He manifested deep concern over those who imagined they had fulfilled the law by observing its letter. He made it dramatically clear that God would put no labels of righteousness upon those who honored him with their lips, but dishonored him with their hands, their hearts, and their very lives. Distorting the Traditions - Those who valued the traditions more highly than the meaning behind the traditions, who worshiped things rather than the Creator of things, and who sought the promises of God apart from the reponsibilities which accompanied the promises received the same rebuke. A Third Distortion - Few things in the historical past had given Israel more trouble than its violation of the strict separatistic policies laid down by the fathers of the faith. The command to be a people set apart had been trumpeted by every religious leader since Abraham; and each time that the chosen people had closed their ears to that command, they had found themselves in the throes of conflict and despair. When Ezra and Nehemiah introduced the law reform in the period of the Restoration, a part of that reform was an insistence upon a strict ethnic separation which even fostered the disruption of established Jewish families. The years between Ezra's reform and the advent of Christ were horrendous ones for the people of God. A whole series of political events literally threatened to obliterate Israel. In the face of such perils, Israel had become so preoccupied with "just plain survival", that history worked feverishly to heighten and amplify Israel's separatist mind. But whatever the causes and events that had forged that mind-set, Jesus saw such separatism as both detrimental to and destructive of the mission first given to Israel in its covenant with Abraham. Labels Dividing the Household - "Separation practices" within the Jewish household itself, which forbade fraternization between "the righteous" and "the sinner" were seen by the Christ as a barrier and as foreign to both the will and wish of God. Such "separatism" turned "religious convictions" into a sordid justification for barriers between people. It was against such kind of piety that Jesus hurled the charge that Israel must reshape its distorted thinking or lose the Kingdom. Separation from the Gentiles - Jesus also showed his consternation over a larger and even more serious separation which Israel practiced over the Gentile world. Though Isaiah, the prophet, had lighted a flame in another day of a universal mission that should include all nations, that flame, for the most part, had been snuffed out and forgotten by the people of God at the point of Christ's coming. The Thrust of His Reform - Christ's ministry and message was directed essentially "to the lost sheep of the house of Israel" for the purposes of reform within the household itself. But it was also Jesus' intent to refan the flame of a universal mission first kindled by Isaiah. Yet the demise of that "separatistic mentality" that was so inhibiting and so limiting of Israel's mission did not come quickly. Even Jesus' disciples had a most difficult time in understanding a message which made no distinction between Jew and Gentile. Christ's many references to "lights put under a bushel" and "salt which had lost its savor" were aimed directly at the deadly kind of separatistic and exclusivistic thinking which robbed many from sharing in the good gifts which God wanted to give to ALL PEOPLE through his instrument Israel. Add to that the surprise that came over Peter and his collegues long after the resurrection when they finally understood that the promises given to Abraham belonged to Jews and Gentiles alike. The subtle remarks of Jesus with the Canaanite and Syrophoenician women made it evident that Israel's distorted understanding, in which separation was seen as an "end in itself", did not dissolve either quickly or easily. The destiny was the same. Israel had been blessed . . . to be a blessing; but when the people took the good things which they had received from God's hands and turned them into curses, the Son of God rose up to protest! As a spokesman to distortion, the Savior steered the people of God back on the road of triumph; and under the direction of the Redeemer's hand, some of them marched on to keep that appointment with their destiny, "to be a blessing!" 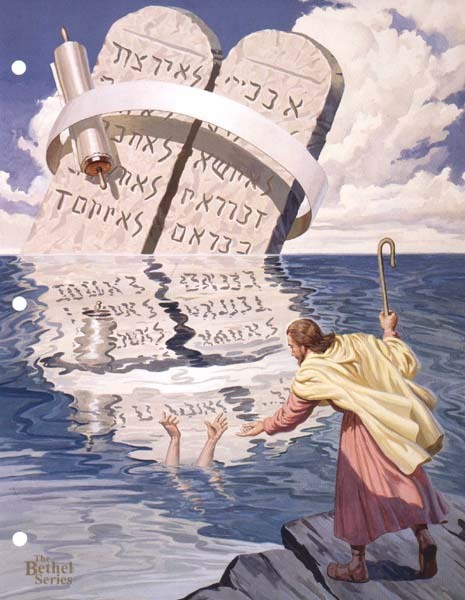 Law tablets - Israel's moral, civil, and ceremonial laws. White band encircles law tablets - Israel's emphasis upon separation. Law tablets, scroll, and separation symbol are seen against a bright sky and white clouds - In the early stages of Israel's national life, each of the laws and traditions had been instituted to serve a good and constructive purpose. Distorted reflection in water - As time passed, these commendable things in Israel's life were put to distorted use. Hands reaching out of water - The distorted use of the good tended to destroy life. Figure - Jesus of Nazareth. Figure faces distortion in water - Jesus acts as a spokesman to distortion and gives an emphasis to the proper and improper use of the law, the traditions, and the institution of separation. Figure in stance of rescuer - Jesus fulfills the law and the prophets. I have come not to abolish them but to fulfill them."